At SAM Gas Projects (P) Ltd we cater to the needs of ammonia cracking units to domestic as well as international market. As we know, ammonia cracker gas unit produces mixture of nitrogen and hydrogen which is usually used in heat treatment furnaces. 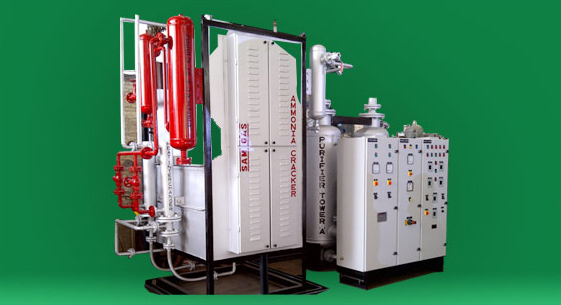 We specialize in offering our range of Ammonia Crackers or Ammonia Cracker Gas Generator, which is commonly used to generate a mixture of Hydrogen and Nitrogen. These are widely used in many industries for heat treatment furnaces and are easy to operate and require low maintenance. Ammonia cracking takes place on Nickel catalyst at 850 degree C temperature. Around 100-ppm un-cracked ammonia is also present in cracked gas and its dew point is (-) 30 degree C.
Cracking of ammonia is one of the most economical way for on-site generation of hydrogen gas for industrial purposes. For this process, the temperature of 850 degree C is maintained in the electrically heated furnace. A centrifugal cast retort is installed in the center of this furnace. This furnace is filled with nickel catalyst. At this stage, the ammonia cracking takes place in presence of nickel catalyst. The process separates its vital element into 75 % hydrogen and 25% nitrogen gas at dew point of (-)30 degree C.
In fact, nitrogen gas is generally inert. This mixture is treated as pure hydrogen gas. This becomes the most economical, trusted, tried and dependable source of on-site hydrogen generation for many small and large industries. A molecular sieve purifier is used after ammonia cracking unit for reducing residual ammonia content and to get very dry gas. This reduces ammonia down to 1-ppm level and dries gas up to (-) 80°C dew point.